The Japanese team began studies at the site on the Nazca Plateau in August 2010 with the permission of Peru’s Culture Ministry. The two new geoglyphs were probably not identified in aerial surveys because of their small size, Watanabe said. He also said the team has filed a report on the new discoveries with Peru’s Culture Ministry and that it would look into the relations between the newly found geoglyphs and the nearby temple. Nazca is located on the southern coast of Peru, about 400 km south of the capital Lima. 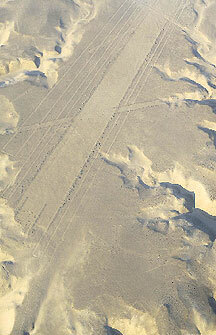 The lines and geoglyphs of Nazca and the Pampas of Jumana were added to UNESCO’s World Heritage list in 1994. The lines, which were etched between 500 B.C. and A.D. 500, are among archaeology’s greatest mysteries because of their number, form and size. The lines and geoglyphs cover about 450 square km. 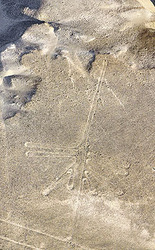 The Nazca Lines have been a source of mystery and dispute since their discovery in southern Peru nearly a century ago. So why should the latest find be any different? Japanese enthusiasts recently released new aerial photographs of figures etched in the ground of the Nazca region, adding a fresh dollop of wonder to the giant geometric patterns and animal drawings that scientists say the Nazca Indians created as many as 2,000 years ago. A Japanese research team said Tuesday it has discovered two new geoglyphs on Peru’s Nazca Plateau, which is designated as a UNESCO World Heritage site for its gigantic lines and geoglyphs. Peruvian officials expressed excitement about the announcement. But Nazca experts said the Japanese discoveries might merely be good photographs of previously known lines. "Saying these figures are new is a risk," said Josue Lancho Rojas, a Nazca historian and writer. "You cannot say at this time that there are any virgin sites." Even if the Japanese figures are not new, the announcement exposed shortcomings in Nazca scholarship. And it raised new questions about the Peruvian government's commitment to sophisticated scientific scholarship. There is no central catalogue detailing the hundreds of lines and figures already mapped and measured. There is no database for archeologists or, for that matter, a team headed by a literature professor from Yamagata University in Japan, to refer to when trying to piece together the history of the Nazca. "There are two consequences to this `discovery,' one positive and one negative," Lancho said. "The positive is that a lot of tourists are going to come to Nazca now, eager to see the new figures. "The negative is that once again it shows that the National Institute of Culture has no central registry of the geoglyphs." Putting together such a list would not be difficult, experts said, but it would take time and money. Though the Peruvian government profits greatly from the flow of international tourists who come to Nazca to fly over the lines for a dizzying display of ancient accomplishment, Peruvian officials say they could not afford such a project. "The government should open its doors and say that all the scientists of the world, all the foundations, are invited to come and work," Lancho said. "But the Peruvian government puts up too many obstacles to projects." Though the Nazca have been studied for decades, rich areas of research remain, said Giuseppe Orefici, director of the Italian Center for Pre-Columbian Archeological Studies and Research. One example is the painstaking excavation of the Cahuachi complex, the Nazca's ceremonial and administrative center. Though Orefici's team has gathered a treasure of artifacts and a wealth of knowledge amid its pyramids and esplanade, Cahuachi is little noticed outside select archeological circles. The Nazca emerged as a distinct civilization about 200 years after the time of Jesus Christ, and they flourished for centuries until the Wari Indians usurped them in the 800s. The Nazca created a system of aqueducts still used today. They were skilled with textiles and ceramics. And they were prolific illustrators in the sand, gravel and dirt of their Pacific Coast region. There are the best-known figures: The hummingbird and the monkey. The spider, the whale and the humanoid figure dubbed "The Astronaut." Trapezoids, circles and long, straight lines seem to be everywhere around Nazca. The famous figures are clear even to the untrained eye. But other lines take work, and sometimes luck, to detect. Whether a figure shows up clearly depends on several factors. Winds take sand and dirt and dust over the plains and hills that were called home by the Nazca and their ancestors, the Paracas. How sunlight falls on the earth affects visibility, so some figures can be spotted only at certain times of the day. Having a good pilot who knows where and how to look helps too. The Japanese, for example, needed several flights to identify their figures. Among their more striking images: what appears to be an animal with horns, measuring nearly 200 feet long. A hummingbird the Japanese recorded might prove more interesting to science, however. A Chilean colleague of Orefici's noted that bird's genitalia appeared different from that on other Nazca hummingbirds. Perhaps this was connected to fertility, the scientist speculated. Such theories go to the heart of what makes the Nazca Lines so compelling. Science has debunked the fanciful idea that beings from outer space must have made the lines. The Nazca were capable of designing the figures using a grid and template system, experts have shown, and the execution of the lines using ropes, sticks and rocks is not complicated. The Nazca used the lines in ceremonies, experts say, and some probably are connected to a calendar. 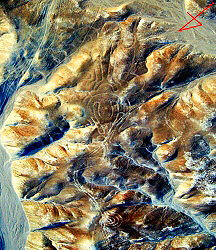 But believers in extraterrestrials still are drawn to Nazca. And even many non-believers find something otherworldly about the place. Orefici is rueful about how talk of UFOs or "new" Nazca lines garners more attention than a critical dig at the Grand Pyramid of Cahuachi. But he understands it too. "The Nazca Lines are interesting because they create dreams," said Orefici, an Italian who has studied in Peru for 30 years and curates the Antonini Museum in Nazca. "It doesn't matter whether I can say they are completely wrong. This is what people want. "To be able to dream, to leave normal life for a little bit," Orefici said. "This is a beautiful part of the geoglyphs."